Spaces for making, thinking, testing, creating. In each academic program, CMU-Q provides specialized laboratory spaces where students can learn, investigate and conduct research. In the Biological Sciences Program, CMU-Q provides specialized laboratory spaces where students can learn, investigate and conduct research. Biology lab – A state-of-the art lab, with equipment for cellular, biochemical, and molecular biology research and teaching. In addition to standard laboratory equipment, the lab has equipment for real-time PCR, next generation DNA sequencing (IonS5), HPLC, and a flow cytometer for cellular analysis. 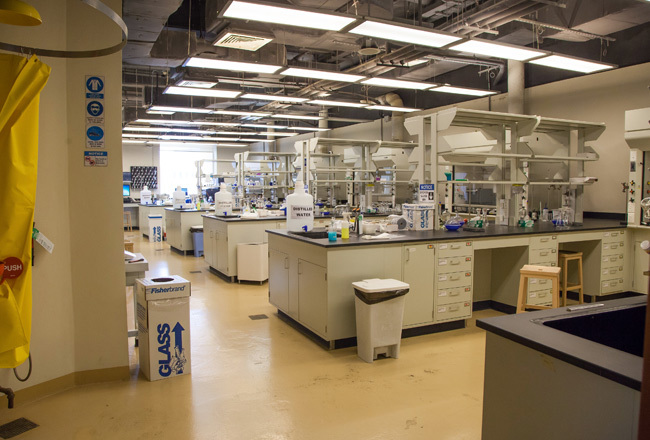 There is a separate room that is dedicated to faculty and student research, which includes a Biosafety Level 2 tissue culture area. Chemistry lab – A teaching lab that is equipped with the instrumentation for an upper level quantitative chemistry laboratory (HPLC, ICP-AES, ion chromatography). 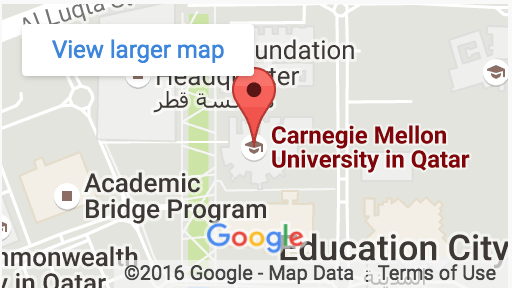 CMU-Q provides dedicated labs providing access to some of the most powerful, industry-standard, employer-respected research and analysis tools available. Q-SmartLab – The Security Market Analytics and Training Lab is a visual interface for big data created at Carnegie Mellon Qatar. Q-SmartLab is a teaching tool for students studying financial markets, as well as a space for research and interdisciplinary collaboration. Bloomberg Terminal – The Bloomberg Terminal brings together real-time market data, news, research, analytics, communications tools and world-class execution capabilities. Thomson Reuters Eikon – Thomson Reuters Eikon provides access to news, data, and analytics on established and emerging markets, deep and varied pools of liquidity, professional networks and comprehensive financial analysis. Cloud Computing Lab (CCL) – The CCL spearheads research into enabling the use of the cloud model for regionally relevant applications. CCL pioneers cloud computing research in the region and is the founding member of the Qatar Cloud Computing Center (Qloud). Natural Language Processing (NLP) lab – The NLP lab addresses multilingual processing and machine translation, with a special focus on improving Arabic language technology and also language learning. Networking Systems Lab (NSL) – The NSL conducts research in many areas of computer networks and systems. Information Systems lab – A teaching lab that allows the flexibility to install, experiment with, and expose students to a variety of unique software and hardware configurations that support their coursework. Human-Computer Interface lab – The HCI lab contains special equipment that enables testing of human interactions with technology. The lab reflects emerging technologies and includes research equipment for students (such as Emotiv brain-computer interfaces, Noldus face reader, and Tobii eye tracker) to explore how the technologies can be applied.